The Army of the Czech Republic (ACR) began their substantive work on Voják 21 (V21) in 2004, with the commencement of two research projects undertaken by domestic firm VOP-026. The first phase provided a single demonstrator system, known as ‘Vojbud' which concluded in 2006. The ACR then commissioned VOP-026 to undertake the follow on ‘Sesedák' project, which ran from 2007 until March 2009 and provided the ‘Modular Combat System of V21' or MBK21, a seven man system which was integrated in an illustrative mechanised platform, BAE Systems Hagglunds BvS10 as part of the test. The ACR moved faster to transfer its focus for soldier modernisation from C4I to weapons that others in Eastern Europe, however even this is undergoing delays. Prior to V21's conclusion, the Ministry of Defence did begin procurement of a new 5.56mm assault rifle to replace the Soviet 7.62x39 mm calibre CZ Vz.58 assault rifle as well as a new pistol and personal defence weapon requirement. This resulted in the order for 8,000 CZ 805 ‘Bren' in early 2010 from domestic firm Ceska Zbrojovka together with the CZ 805 G-1 40 mm under-barrel grenade launcher. The pistol selected was the company's CZ 75 SP-01 Phantom 9x19 mm semi-automatic pistols and Skorpion EVO III PDWs in the same calibre. Delays to the procurement of the Ceska Zbrojovka CZ 805 assault rifle however, were announced by the Ministry of Defence shortly after the LGC/1 meeting of in Prague, which were attributed to funding issues in the 2011 Financial Year. Competitors of Ceska Zbrojovka in the decision to select the CZ 805 have also criticised the decision saying that the CZ 805's development was incomplete and did not meet the requirements of the tender. Protests are expected. The ACR announced in October that it would to boost its presence in Afghanistan from 200 to 720 personnel, which will require a increase the level of equipment already fielded specifically for Afghanistan. For local communications, the Czech Force have fielded the Dicom PR20. 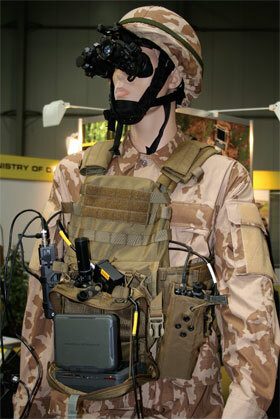 Troops with the 5th Special Forces Regiment in Afghanistan have also used the Harris RF-7800S-TR. Additional communications have been acquired to meet requirements in Afghanistan, Lt.Col Karmazin said, “In Afghanistan, we co-operate with American soldiers. We acquired special radios because the frequencies used by the Czech Republic are different to those in Afghanistan.” Amongst the radios acquired is the Harris AN/PRC-152. To meet C4ISTAR requirements for Afghanistan particularly ground to air co-ordination, specific ensembles have been fielded. The suite of equipment include a Thales AN/PRC-148 JEM, L-3 SIR receiver, Ultralife power amplifier and General Dynamics Itronix computer. In addition to the assault rifle, pistol and PDW, the ACR is procuring three sniper weapons in 12.7mm, .338 Lapua 7.62mm. The 12.7mm calibre solution is the domestically produced ZVI Falcon manually operated bolt-action rifle with a bullpup configuration with the 7.62mm solution being the CZ 755. It is understood that the .338 Lapua solution will be a collaboration between Ceska Zbrojovka and Steyr Mannlicher using elements from the latter's SSG 08 tactical rifle.